I am so excited that we finally made reservations, and everything is a done deal now! After much procrastination, I finally booked the car, and hotel. I had the flights booked since June 23. As you can imagine, I feel like a weight has been lifted. For over a month, we have had plans to fly into SLC airport on Friday, August 10th and fly out of LAS on Friday August 17th. We didn't even know how we were getting from SLC to Las Vegas, or where we were staying once we got there. So, now we know we will be driving there. The car long distance is going to cost about half of what 2 flights would have cost. I didn't want to take a bus. I think driving there will be fun, and it is only about a 6 hour drive, to me that is nothing, I am used to the 13 hour drive up to PEI. We will ditch the car as soon as we get there, at the airport, and take a shuttle service to the hotel. We stuggled with where to stay, what was most affordable but still nice, and settled on Treasure Island. Initially we were thinking of staying in Old Vegas (downtown) at the Golden Nugget for two nights and then moving to the strip for another two nights, but realistic thinking prevailed. Who wants to change hotels every 2 days? As it is, we are staying 3 nights in Park City, too much packing and unpacking can put a damper on a trip. So, 4 nights at Treasure Island it is. I am bringing my computer. I hope to document this trip as best I can with pictures and stories of our adventures. At the very least, it will be fun for me to read later on. Now I need to research what yokel towns we will be passing through on the road trip there. YAY! 13 days till the start of our trip! This is just a quick post to show two pictures we framed today. I need to add framing posts more often. These prints are signed by the artist Olivia, AND Bettie Page herself. The customer is so happy with them, she picked them up today. I made this bracelet on and off all day. I had a piece of sterling rod (2mmx4mm) that I had been looking at for months, and then I started sawing. I sawed the rod down the middle on one side about 4" and down the other side about 2". I left 3.5" in the center uncut. 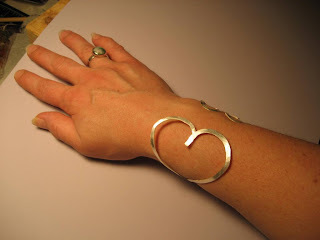 The cuff is hammered, and the heart center is soldered closed. It still needs a bit of filing, sanding, and shaping, but it is almost there. Here is the heart part. Here is the coil part. This is they way it should be worn. Heart on the outside. It's also the most comfortable way to wear it. Some more photos, so you can see all the nooks and crannies. It is not finished yet. Keep that in mind. 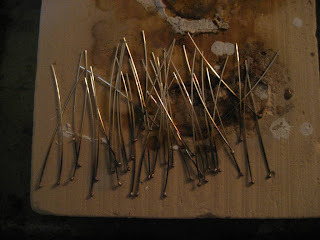 Headpins are a necessary supply for jewelry designers of all skill levels. With the rising cost of silver, they have become quite expensive. So why not make your own? It is easy, doesn't require too much equipment and they are a fraction of the cost of buying them. 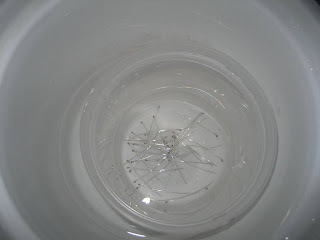 All you need is wire cutters, a small torch such as a butane creme brulee torch, a heat resistant surface, a glass jar or crockpot with a mild acid (warmed vinegar mixed with salt works well), and a pair of tweezers. Always wear eye protection and work in a nicely ventilated area. 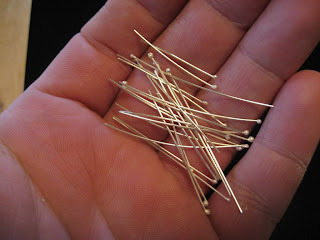 Try them, you may never buy headpins again. 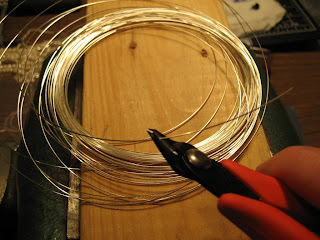 I am using 24 gauge sterling silver wire, but this method will work with any smaller gauge wire you want to use. 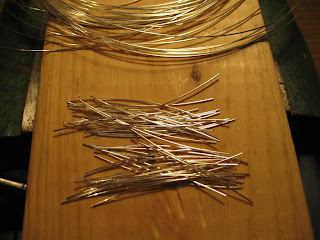 First, get yourself some wire and cut a bunch of lengths. Hold the small piece of wire in a pair of tweezers just outside the blue cone and slightly above the flame until it balls up. You can adjust the size of the ball by how long you let the silver melt. Be careful though, the ball can easily fall off creating a splash which is dangerous. So hold the wire very close to the heat resistant surface. The wire is so thin, that it is unnecessary to quench, they cool off very quickly, I just lay them out until I have a whole bunch. Now scoop them all up and toss them in the mild acid bath. I use a crock pot so I don't have to keep warming the solution when I am working for a long time. A plastic container submerged in the pot with holes drilled in makes for easier removal. Keep them in until they are all cleaned. Usually just a few minutes. Rinse them off and voila! Headpins! You can now sand them and polish them, or just leave them like this. I tend to like the more organic look so I just tumble them for a little bit for strength. They look like tiny little silver pearls at the end of the wire. I have been in a sort of creative funk recently. I suppose it could be the fact that all I have been selling is headpins and noserings. 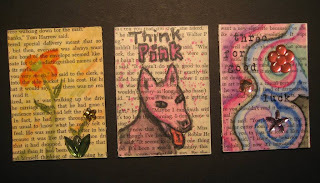 I am up to my ears in headpins right now, and the noserings keep selling even tho I upped the price. 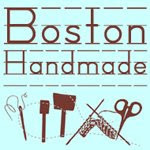 I am happy to sell these items, don't get me wrong, but I am not a headpin machine. I have other talents, or so I thought. Anyway, I plan to finish these pendants tomorrow, and get good pics of them on chains in the sunlight. I photographed these in my extremely dark home with a couple of lights, I think they came out okay, but I can do better. They are not completely sanded, filed and polished yet. 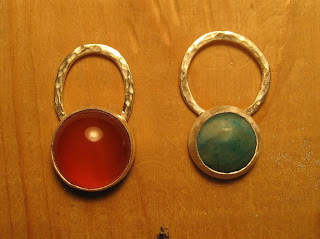 A carnelian cab and a turquoise cab. The carnelian is approximately 15mm and has an oval hammered ring for the bail, the turquoise is approximately 12mm and has a round hammered ring for the bail. They both have a very organic feel to them, as I am still new to bezel settings, but I think they look okay. I need to smooth them out a bit and polish them still. Here is a shot of the backs. I have delusions of signing the backs, but I know that they are just delusions. I wish I had a stamp. I also made 10 noserings today. I got a special order from a girl that already bought one from me. She wanted two more in graduated ball sizes. I am the nosering/headpin queen! I made two pairs of earrings tonight. 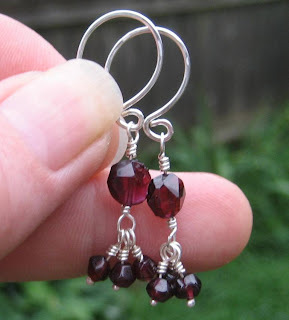 The first pair is garnet. 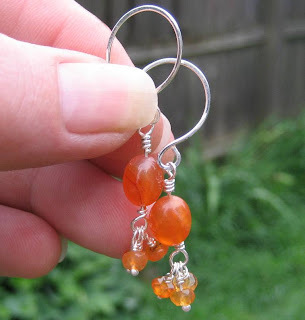 The second pair is carnelian. 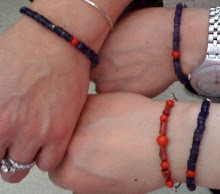 They are pretty much the same, just different beads. On a different note, I got an order today for 100 headpins. Yay! So, all of you who know me and know what I look like will probably be saying... 'It's about time'. 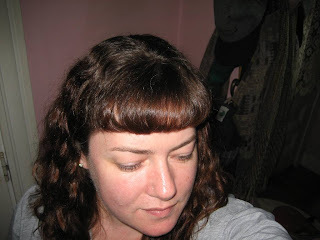 I have been growing out my bangs, trying to settle on a new look unsuccessfully. I keep doing this, I don't know why, because I look best with the short Betty Page bangs and long hair. Today before I went to work, I cut the bangs. It took me a full hour to get it right, I am very particular in how it looks. I am the only one who can cut them to my specifications. This saves hundreds on haircuts, thousands even! I am a drip dry girl, and even tho the bangs require blowdrying, I am already happy I did it. Bangs rule! For me anyway. So there ya go. Bangs cut, instant style...or not. For me it is. Damn! I should have worn lipstick! Perry got sprayed by a skunk tonight. It has been a few years, so I guess Scott and I were caught off guard. Usually when we start smelling them around, we will take precautions, however, we have not smelled any skunk this season so far. So we were naive and stupid and are paying for it now. He still stinks of skunk, even after a skunk bath. Perry is normally free to roam the yard (fenced in) at any time of year. When we start smelling skunk around, he is confined at night by a chain on the back porch when he wants to go out. We heard something out the window tonight, and then knew right away when Perry started jumping on the back door to get in. I walked into the kitchen to get the screen open for him, and was almost knocked down by the smell. Needless to say, I didn't let him in. I called to Scott to get the shampoo, and a towel, and quick. We washed him, we need to do it again when Scott gets home (he went out tonight, I think he will be home early if his friends smell skunk). We took showers after we bathed him, so we are doing fine, but the clothes we were wearing may not fair so well. If someone knows some trick to keeping skunks out of your yard, please let me know. Our yard is fenced in with a six foot cedar picket, and we routinely make sure that areas around the bottom of the fence are free from gaps. I need a pet friendly deterrant for skunks! Oh! It's friday the 13th! That explains it. 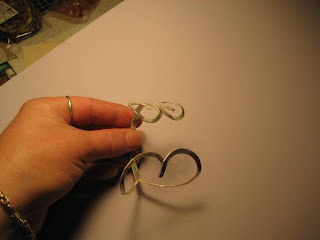 I spent the better part of tonight making sterling silver rings. 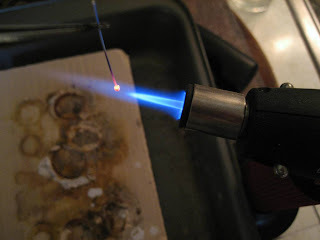 I actually had a hard time soldering with hard solder (medium and easy solder are no big deal with the propane torch). The hard solder is tough with just a propane torch, but I got it to flow after many failed attempts. Especially on this first ring, and the last one. 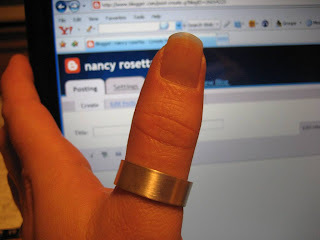 The middle ring was easy because it is so thin and heats up quickly. So this first ring is made from 4mm sterling dome rod which is 2mm high. Really thick if you ask me. 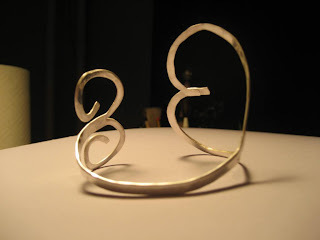 I had to anneal this piece about 10 times to get it to even have any sort of give to shape it. 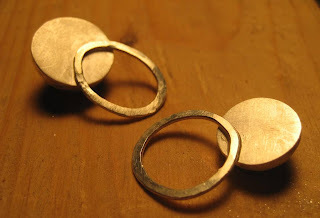 I started out with just the rod and cut a piece the size I wanted and I couldn't even bend it at all before annealing (even during annealing for that matter...I had to keep annealing to get some give). Size 8 1/2 and scored with a saw 8 times around it to add some design. I don't think it is done. 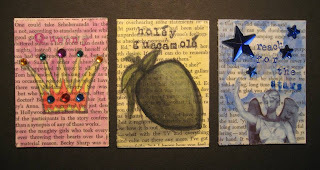 I will add more design to it when I get home from work tomorrow, and then list it on etsy. 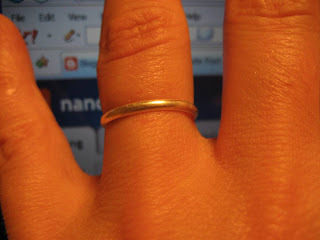 This ring is 14gauge 1/2 round wire just soldered into a circle and then filed and sanded. 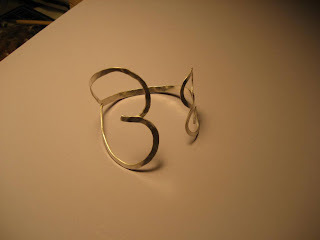 I may do some sort of design on it, but it is really small, so I may just leave it as a plain band. This ring is size 7 1/2. 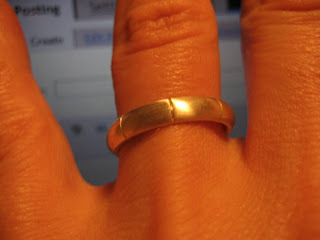 This is a manly band, a stout size 12 and 8mm wide. It is 1mm thick. 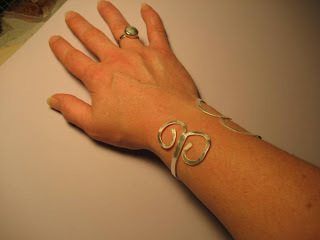 I used sterling silver sheet for this one. 18 gauge. Sawed out the shank and soldered it closed. I will definately do some sort of design on this, I may even solder something to it. Ok, so maybe none of these rings are 'done', but at least they are started. I will work more on them tomorrow, make more designs on them, and polish, polish, polish! Check back to see the finished rings! 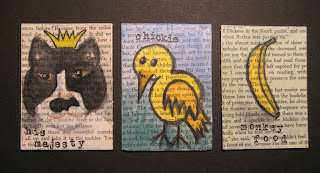 I made these cards for an artist trading card swap with some jewelry friends. 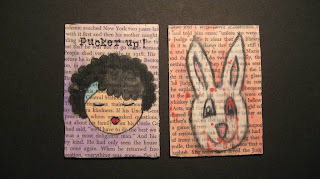 They are watercolors on old book pages pasted to matboard.